Today, Kinross Gold U.S.A., Inc., will complete the first purchase of habitat credits to offset impacts to greater sage-grouse through the Nevada Conservation Credit System. 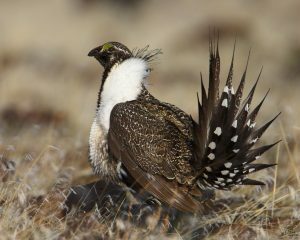 The transaction will take place at a signing ceremony in Carson City, Nevada to commemorate the long-term stewardship of nearly 10,000 acres of vital sage-grouse habitat. Kinross is the first company to participate in the program, buying credits to offset the environmental impacts of its Bald Mountain gold mine in northeast Nevada. The credit projects will include a variety of conservation activities, such as grazing management and fencing maintenance, which will take place over the next 30 years. The transaction marks a significant milestone in the sage-grouse story, and in America’s conservation history. The deal could not come at a better time for the imperiled bird. There is a November 27 deadline to provide public comment on the Interior Department’s plan to reopen the federal sage-grouse plans – the very plans that kept the bird off the endangered species list two years ago this fall. Ultimately, any move to undermine the plans would replace science with politics, and put the threat of listing back on the table. Nevada and Kinross are helping keep the historic collaborative conservation effort for sage-grouse afloat. 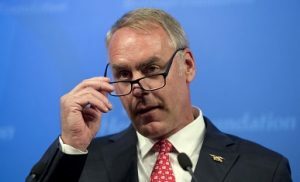 They are demonstrating great leadership, responsibility and collaboration, while the federal government is doing the opposite, ignoring the overwhelming chorus of stakeholders telling the Interior Department to let the plans work. Today’s transaction proves that the plans can work, if we let them. The 10,000-acre deal was made possible by the Nevada Conservation Credit System – a state-led mitigation program that ensures impacts to greater sage-grouse habitat are fully offset by long-term enhancement and protection of habitat that result in a net benefit for the species. But it’s not the only program of its kind. 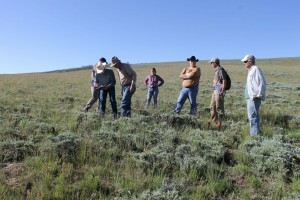 Other states, including Colorado and Wyoming, developed similar programs, thanks to ranching, industry, conservation and state agency partners coming together well in advance of the listing deadline to identify incentives that support voluntary conservation for sage-grouse. The Colorado Habitat Exchange and Wyoming Conservation Exchange ultimately created the model for the Nevada Conservation Credit System, and together these programs, along with others, precluded the need for the bird to be added to the endangered species list. These programs are a model not just for sage-grouse conservation efforts, but for all wildlife conservation efforts across America. They prove that pre-list solutions do exist, and that there are ways to work within the regulatory framework of the Endangered Species Act that don’t create burdens on industry and landowners. If we continue to collaborate and innovate, we can find solutions that work for both people and wildlife. Thank you, Nevada and Kinross, for helping us swim forward, together. A bird has united thousands. It will not divide us. This entry was posted in ecosystems, Endangered Species Act, Habitat Exchange, Partnerships, Wildlife Protection and tagged bald mountain gold mine, BLM, Colorado Habitat Exchange, Endangered Species Act, environmental defense fund, habitat exchange, Interior department, kinross, mining company, mitigation, Nevada, nevada conservation credit system, ryan zinke, sage grouse, Wyoming Conservation Exchange. Bookmark the permalink. Both comments and trackbacks are currently closed.